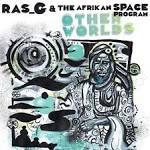 Ras G has been a fixture in the scene of forward thinking hip hop and experimental electronic music producers out of Los Angeles. Ras is a modern-day Sun Ra, whose output has been staggering to say the least, with over 10 LPs in the last couple of years, his creativity knows no bounds. On this 45/7″release for (iN)Sect Records, he turns in five songs that are made up of chants, rhymes, 808 bass drums, the future, the past and most importantly a vision, that has remained true to itself from the very start, and the Poobah/Brainfeeder/Leaving Records artist is most likely just getting started. This 45 is limited to 300 copies total.